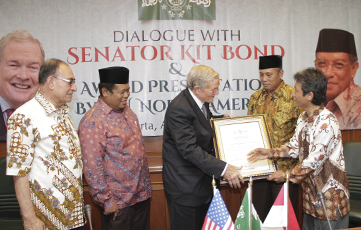 Associate Professor of Religious Studies Shalahudin Kafrawi recently presented an award to Christopher “Kit” Bond, a former Senator from Missouri, during a dialogue in Jakarta between Bond and the officials and members of the Nahdlatul Ulama (NU), Indonesia’s largest socio-religious organization. Kafrawi was invited by the Nahdlatul Ulama of North America and the Indonesian embassy to the U.S. to present the award. The Nahdlatul Ulama of North America Award was given to the senator for “his dedication in promoting better understanding about the role of moderate Islam in a new democratic Indonesia and his efforts to build a coalition of peace through empowering civil society and working across the spectrum of religion-based organizations,” according to Kafrawi. “This award recognizes the senator’s efforts to promote global peace through dialogue and is meant as a symbol for the Nahdlatul Ulama’s support to bridge differences between Western and Muslim worlds, and especially between Indonesian Muslims and Americans,” he explains. The Senator and Lewis Simons co-authored a book, “The Next Front: Southeast Asia and the Road to Global Peace with Islam” wherein they showed their willingness to listen to Muslim voices regarding peace and religious extremism. They also emphasized the strategic role of the South Asian countries in eradicating religious extremism through dialogue. Various national news organizations (such as Antara News, Tempo, Republika, and Tribun News) and blogs reported the event in Indonesian language.